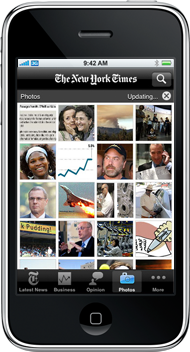 Despite getting unfairly ripped with iTunes ratings, The New York Times iPhone Application is by far and away my favorite app. Sure others are cool (MLB.com and virtually anything using the accelerometer), but the NYT app is the most useful. In fact, in just a couple weeks, it's transformed by morning ritual - I roll out of bed, thumb through the newspaper and do it without waking up Anette with the annoying Blackberry clicking noises. So we're all happy. And while I love the NYT app and appreciate that they've made it free - I do have some suggestions... so if you're reading, how about some of these features for v2?! 1. Let me email articles directly from the app. Hugely annoying that I can't load up the contact book and/or enter an email address! 2. Use those emails to add to the 'Most Emailed' section. With the number of users actively using the app - this is a ton of useful data. 3. Let me rate articles and photos. Use my preferences and ratings to eventually build out a recommendation engine. 4. Load the app faster. The photos in particular load slower than any other app on my iPhone. I'd use it more often, if I could load pages faster. 5. Add a touch-based scroll bar to the article pages. It can take for ever to scroll through lengthy articles one thumb-touch at a time. There has to be a faster way to scroll or at least jump to the bottom of the article. 6. Get some new ads. I'm all for placing ads in the app as long as it's free... but I can only see so many Westin ads and act interested. 7. Make the author names clickable. For great articles, I'd like to read other pieces written by the author. Link the name to his / her other articles. Again - it would increase my consumption. 8. Give me a pivot point off each article page. Currently, the only option to view the next story (blindly I might add!) 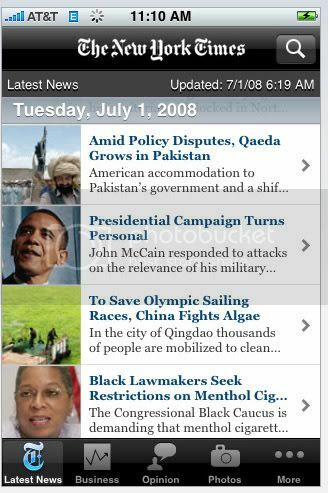 or pick a new category... add other options such as related articles. At the very least, add the categories that the article sits within! 9. Add a headlines / tag view I love the photos category and enjoy browsing visually. This would be equally interesting if there was a finding experience by headline or tag. 10. Allow favorite searches to be stored. There are searches that I would like to keep either as a category or (at least) within the search category. Let me store them!